Welcome to the Fit Small Business Xero training course! In this lesson, we’re going to cover how to convert from QuickBooks to Xero. Xero allows you to convert data for the last two fiscal years. This will give you the ability to run comparison financial reports such as income statement, balance sheet and cash flow statements. Having the ability to compare the current year to previous years can help you to identify trends in income and expenses and other key areas that impact the bottom line. Note: If you want to convert more than two years worth of data, there are a few Xero partners that will do it for a cost. You can learn more here. By converting your existing data, Xero will transfer all of your information such as customers, suppliers, invoices and bills. This can save you a lot of time that you would have normally spent setting up your business from scratch. Note: If you did not do a good job of managing your books in your old system and you would prefer a fresh start then you should not convert inaccurate data. As the old adage goes “Garbage in, garbage out”. Head over to our How to Set Up Xero course which includes 15 video tutorials that will walk you through step by step on how to set up your business from scratch. As a business owner, we know how tight cash flow can be. Xero will convert your QuickBooks file for absolutely free! To ensure a successful conversion, there are a few steps that you need to take to prepare your QuickBooks file for the conversion. We will cover these next. You must have a US edition of QuickBooks Windows or Mac version that is 2007 or a newer version. You currently use a US edition of QuickBooks Online. You have never turned on the multi-currency feature in QuickBooks. If you meet these requirements, then Xero will convert the current year and the previous fiscal year, if this information is in the QuickBooks file. Let’s assume our fictitious company, Acme Web Pros Plus has 5 years worth of data in their QuickBooks file. As of June 2017, they have decided to start using Xero to keep their books. Xero will convert all of 2016 and January thru June 2017 over to Acme’s Xero account. Any data prior to January 2016 will not be converted. Instead, it will be summarized into the conversion balance as of 12/31/15. Check out our How to Set Up Account Balances video tutorial for more info on conversion balances. If you meet all of the above requirements, keep reading to learn how to prepare your QuickBooks file for a successful conversion. However, if you do not meet all of the requirements, you should head over to our How to Set Up Xero course to learn how to setup your organization from scratch. Complete outstanding tasks – Make sure all bank accounts have been reconciled and all open credits have been applied to their respective invoices/bills. Clean up your data – If there are errors or inaccurate information that you have been meaning to fix, take care of it before converting your data. For example, if you need to update customers or suppliers contact information like phone number, address or email. Chart of Accounts – The chart of accounts cannot have more than 699 accounts, including inactive accounts. If you have too many accounts, delete accounts that have never been used and merge any duplicate accounts. Turn on account numbers – Unlike QuickBooks, Xero requires that account numbers (known as account codes in Xero) are used. By turning on this feature and assigning account numbers in your QuickBooks file, Xero will convert those accounts to account codes. Note: If you do not assign accounts in QuickBooks before converting the file, Xero will assign account codes to all accounts during the conversion. Renumber sub-accounts – While QuickBooks uses sub-accounts, Xero has a flat account structure. Therefore, if you have sub-accounts on your QuickBooks chart of accounts, you will need to make sure that an account number has been assigned to each sub-account. Before we walk through the steps to upload your file, you must save it using the appropriate file type. Refer to the chart below on the acceptable file types and instructions on how to save the file. 3. Select All Financial Data. Follow the steps below to upload your QuickBooks file to Xero. Step 1 – Sign up for a Xero Account & Activate your Account. Click here to sign up for a Xero Account. You should see a screen similar to the one below. Step 2 – Open the Activation Email from Xero. Click the “Activate your Account” button. Step 3 – Add your Organization to Xero. 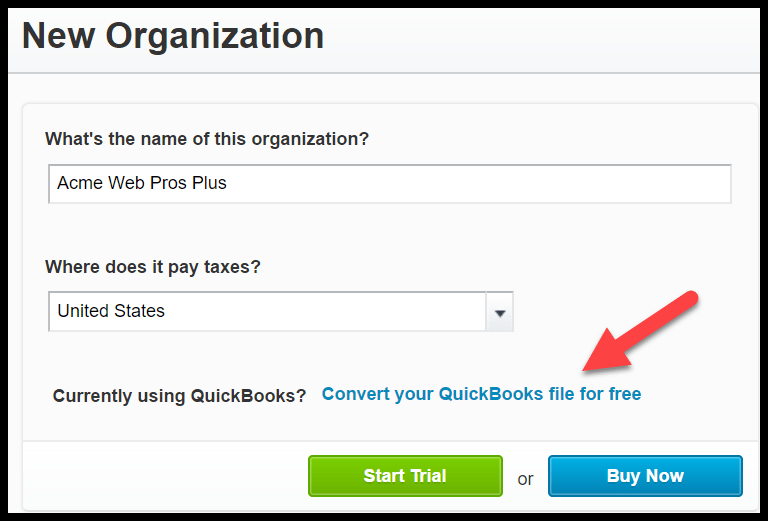 Complete the fields below and click the “Convert your QuickBooks file for free” link as indicated in the screenshot below. Add a New Organization to Xero. Step 4 – Confirm That You Are Using QuickBooks. 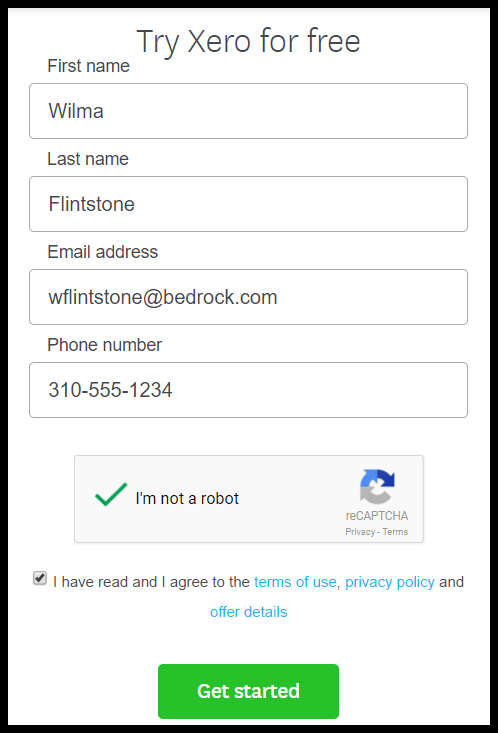 In the screenshot below, confirm that you are currently using QuickBooks. 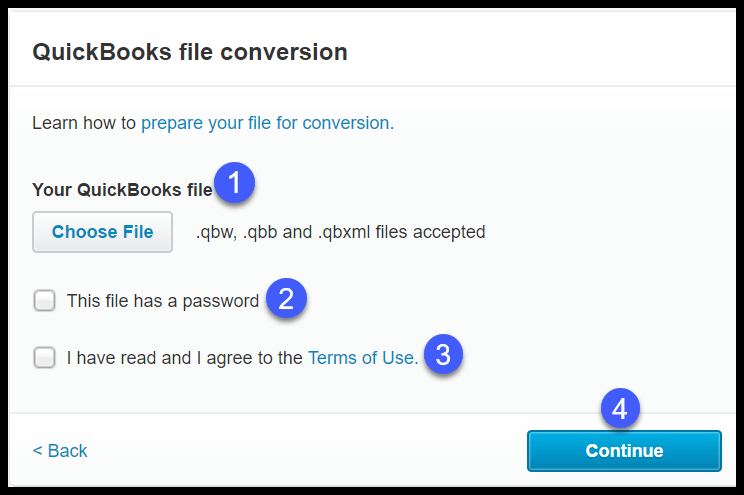 Start QuickBooks File Conversion to Xero. Currently using QuickBooks? – Put a checkmark in this box to indicate that you have a QuickBooks file that you would like to convert. Continue – Click the “Continue” button to proceed with uploading your QuickBooks file. Step 5 – Provide Info for QuickBooks File Conversion. Next, you will provide the necessary info and upload your QuickBooks file as indicated in the screenshot below. Choose File – Click the “choose file” button and attach your QuickBooks file. Note: Be sure it is in one of the acceptable formats that we discussed earlier (.qbw,.qbb and .qbxml). File password – If your QuickBooks file has a password, you will need to check this box and enter the administrative user id and password for the file. You will not be able to convert the file without the administrator’s user id and password. Note: In general, if you are the only user, then you are also the administrator. Continue – Click the “Continue” button once you have attached your file and completed all of the info. Step 6 – Let Xero Do the Rest. After you click the Continue button, the process of converting your QuickBooks file will begin, as indicated in the screenshot below. Note: Conversion can take anywhere from 3 hours to several days, depending on the size of your QuickBooks file. Check out view progress and fix errors in a QuickBooks conversion for a status update on your conversion. Once a conversion is complete, you will receive an email notification that the conversion is complete. Log into Xero and follow the instructions to accept the subscription transfer. You will be prompted to select a subscription plan and enter your billing details before you can review your data. Note: Changes made to any of this information can cause your financial statements to be inaccurate. Verify that all bank and credit card accounts that were reconciled in QuickBooks are marked as reconciled in Xero. If you find that you need to reconcile a few items, instructions on how to do this can be found here. Compare Trial Balance Reports – Run a trial balance report for the end of the current month in Xero and QuickBooks and compare them to ensure that they match. To run a trial balance in Xero, go to Reports>>All Reports>>Go to the Accounting Section>>Select Trial Balance Report. Note: The trial balance report is based on the accrual accounting method. Therefore, we recommend that you run the trial balance in QuickBooks using the accrual accounting method so that you can compare “apples to apples.” Otherwise, if you run a cash basis trial balance from QuickBooks and compare it to the accrual basis trial balance from Xero they will not match. Find & Fix Unidentified Invoices/Bills – Sometimes invoices and bills will lose details during conversion; such as contact name. If this occurs, the invoices and bills will display under the contact name “No Contacts” in Xero. The best way to identify these invoices/bills is to run an accounts receivable aging report and an accounts payable aging report in both QuickBooks and Xero. In order for Xero to match QuickBooks, you will need to add any missing bills or add any missing invoices to Xero. For more troubleshooting tips on converting your QuickBooks data to Xero, check out how Xero handles converted QuickBooks data and Xero’s guide on converting from QuickBooks to Xero. After you have verified that your data was successfully converted to Xero, it’s time for you to get up to speed on how to use Xero! Lucky for you, we have created a free Xero course that includes step by step written instructions and video tutorials to show you how to do just about anything in Xero! In addition to setting up Xero, we’ve got tutorials that will help you run your business. Below is a list of all of our Xero courses which you can access here for absolutely free. 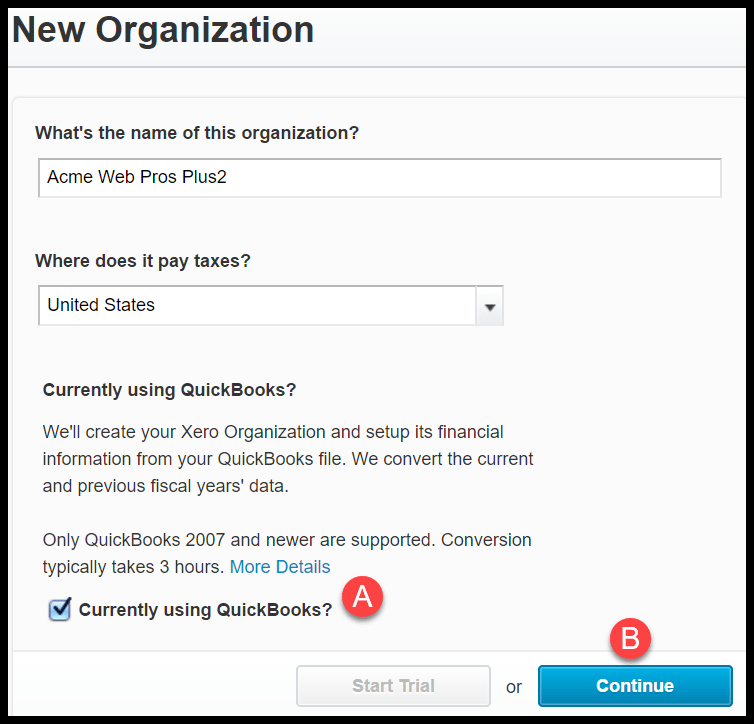 That wraps up the section on how to convert from QuickBooks to Xero. To access this lesson or any of the others in the series, click here. For a free 30-day trial of Xero, click the link below.